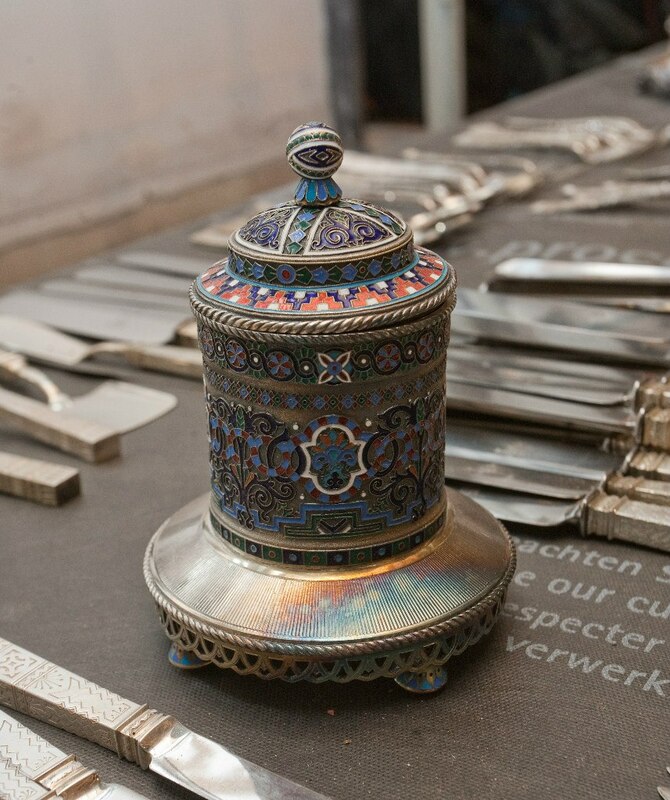 Construction workers restoring a 19th century mansion that once belonged to the noble Naryshkin family discovered an immense treasure of silver services, pearl- and porcelain-handled flatware, enamel, jewels, and medals, hidden in a secret storage compartment between the second and third floors of the building. 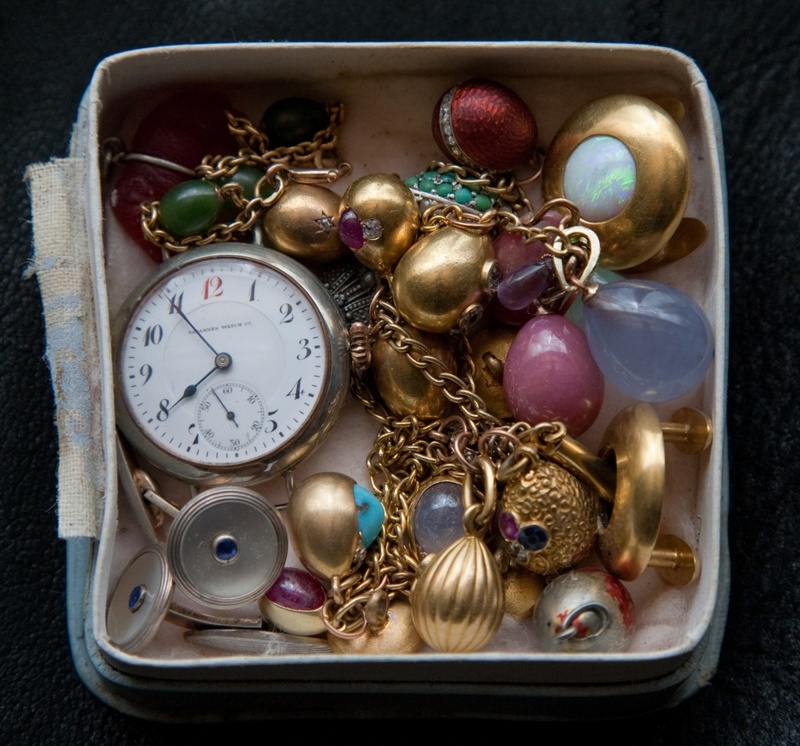 More than 1,000 individual pieces from the 19th and early 20th centuries were found, all of them in excellent condition thanks to careful packing in vinegar-soaked cloths. 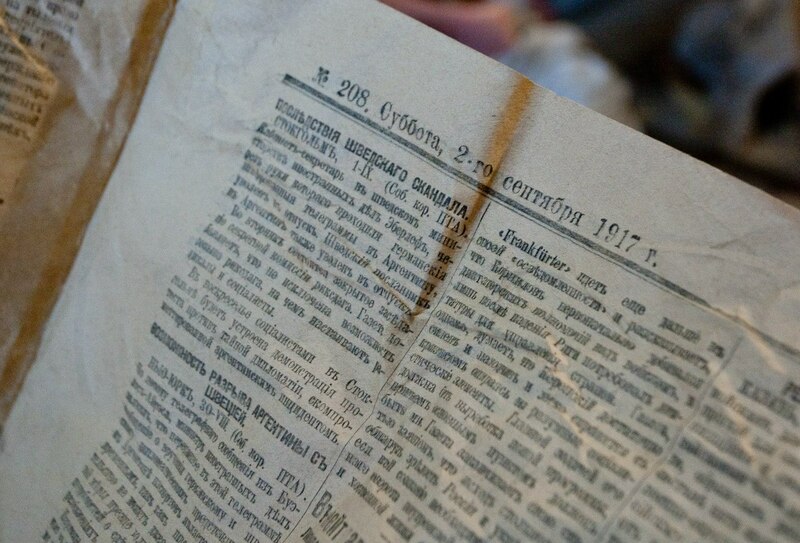 The objects were then wrapped in newspapers from March, June and September of 1917, which gives us a handy time frame for when the treasure might have been buried. This was a turbulent time in Russia, to say the least. The Duma had taken control in February, setting up the Russian Provisional Government and forcing Tsar Nicholas II to abdicate. Some months later the October Revolution would bring the Bolsheviks to power. Within days, Lenin’s Decree on Land abolishing private property was passed by the Second Congress of Soviets. The first floor of the mansion was put to use as a stolovaya, a cafeteria-style restaurant where workers could get a cheap meal. The Naryshkin family, whose many illustrious members include Nataliya Naryshkina, wife of Tsar Alexis and mother of Peter the Great, and Princess Maria Naryshkina, mistress of Tsar Alexander I, fled the country in 1917 leaving behind a wealth of riches that were moved to the State Hermitage Museum in 1920. 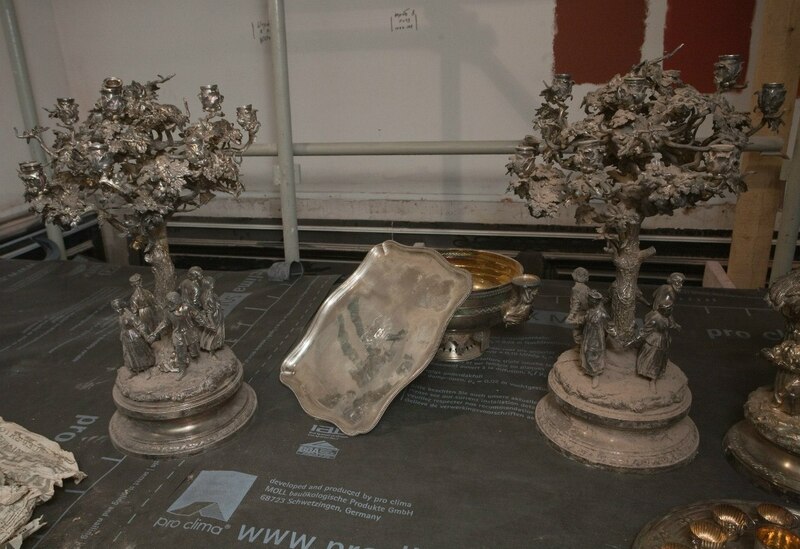 Several of the silver sets found in the mansion bear the family crest. The treasure might not all have belonged to the Naryshkins. 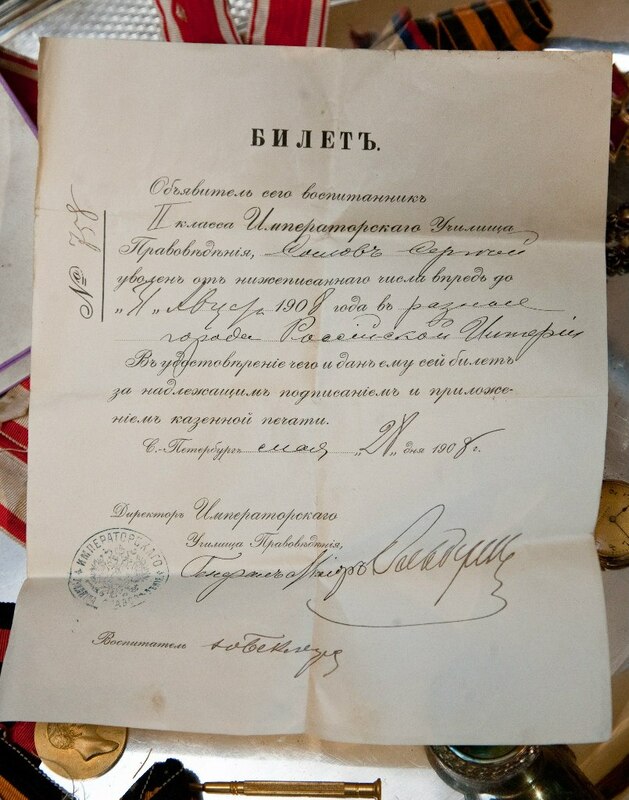 Documents belonging to army officer Sergei Somov were also found among the objects, so perhaps some of it was once his. Somov also fled the country after the October Revolution. He died in France in 1976. 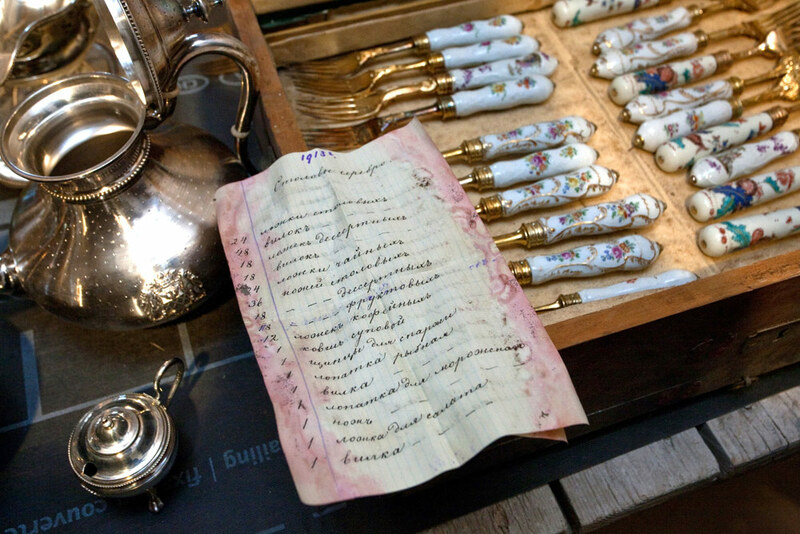 The mansion is itself a historical treasure, despite the hard treatment it has received. It used to be two separate buildings, one of them built in the 17th century by Prince Pyotr Trubetskoi, the other owned in the 18th century by Abram Petrovich Gannibal, the African great-grandfather of poet Alexander Pushkin who as a child had gone from being a hostage of the Ottoman Sultan to the godson of Peter the Great who had him raised and educated along with his own children. In 1832 the two houses were made into one large mansion which Duke Vasily Naryshkin bought in 1875. After the fall of the Soviet Union, the Trubetskoi-Naryshkin mansion was converted into apartments. In 1999, the St. Petersburg International Center for Preservation set up offices in the historical building. Ten years later, construction company Intarsia began a three-year program of re-engineering, restoring and adapting the building for use as a restaurant (doubtless a pricier one this time) and a conference and cultural center. Intarsia reported the discovery to the police on Thursday, March 29, but it appears some pieces were discovered by workers a few days before that. 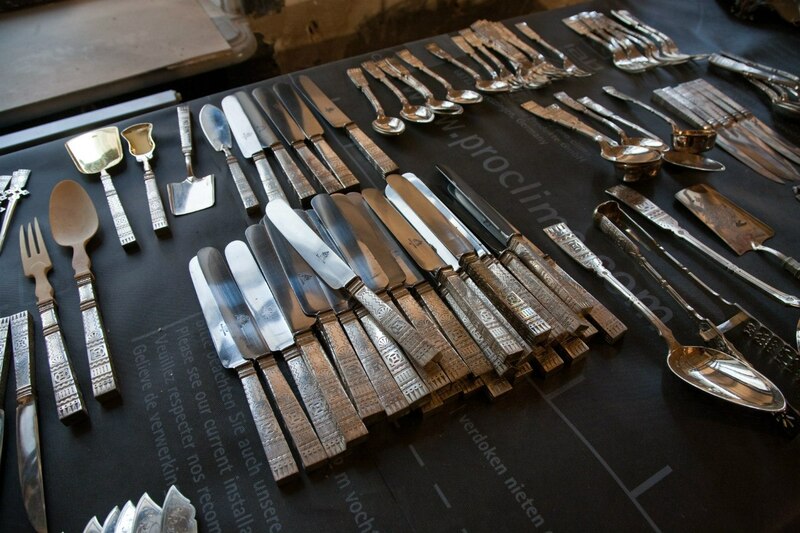 Police searched the site and discovered two caches, one containing three gilded silver salvers, the other a box of silver forks and spoons, which had been secreted behind construction debris. Some workers apparently hoped to smuggle them out when the coast was clear. 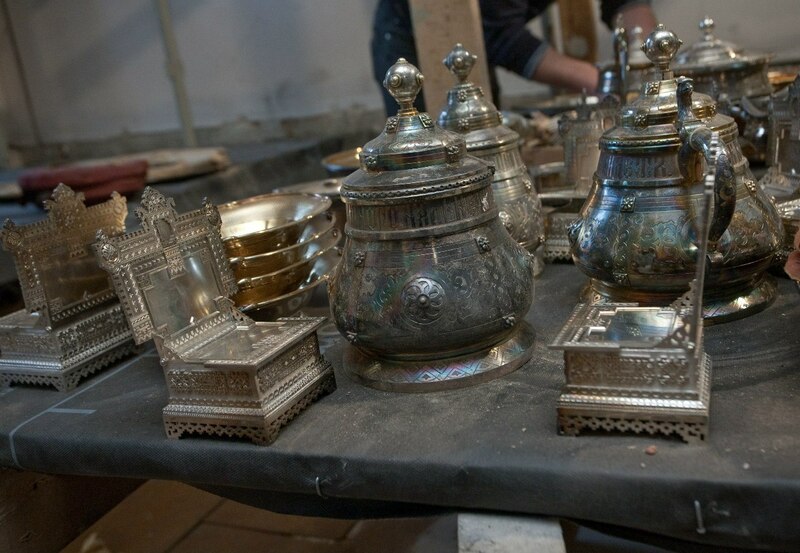 A full inventory and assessment of the treasure by St. Petersburg’s Committee for the State Control, Use and Protection of Historical and Cultural Monuments (KGIOP) is ongoing. 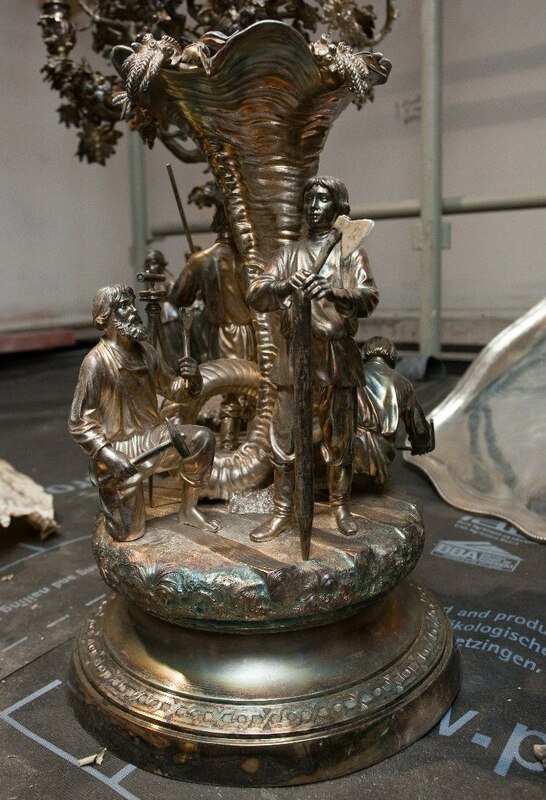 When they’re done, the treasure will be put in a museum. Intarsia hopes they’ll be able to put it on display in the second floor exhibition rooms of the Trubetskoi-Naryshkin mansion once the restoration is done later this year. The question of ownership might get thorny, though. By law, the workers who discovered the treasure can claim 50% of it and the property owner the other half, unless it is deemed of historical or cultural value, which in this case seems a foregone conclusion. 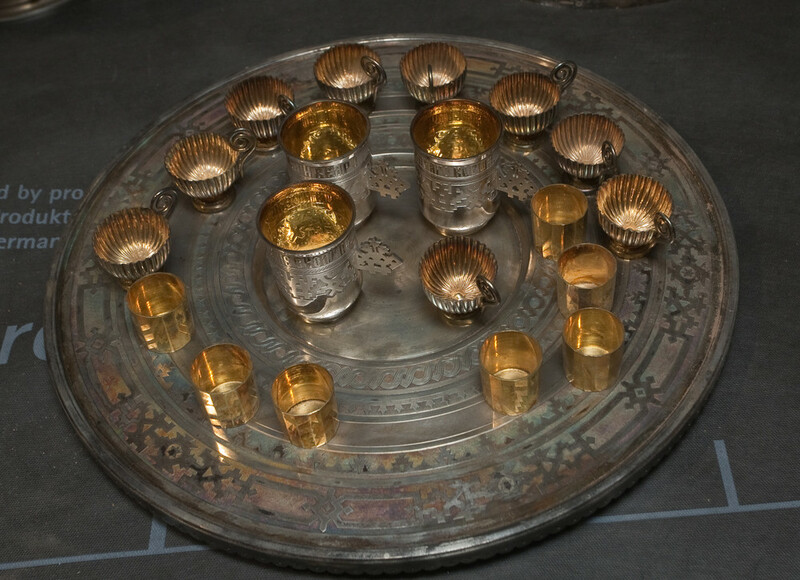 If the treasure is deemed historically significant, the state will claim ownership and reimburse the finders/owners the market value. Then there are the family members. Any Naryshkin descendants who might be out there could make a claim, as could any Somov descendants. Ivan Artsishevsky, chairman of the House of Romanov, said the discovery of the treasure could cause self-proclaimed Naryshkin descendants to step forward, demanding the treasure be returned to them. “In my experience of working with the Romanovs, I can say that ‘secret’ descendants from the Emperor’s dynasty regularly appeal to me with all kinds of claims and demands. In this case many such ‘relatives’ may appear,” Artsishevsky was quoted as saying by Interfax. Artsishevsky said all of the precious objects found should be donated to a museum, adding that he was sure that no real Naryshkin descendants would come forward in hopes of claiming the treasure. “All this should be given to a museum. 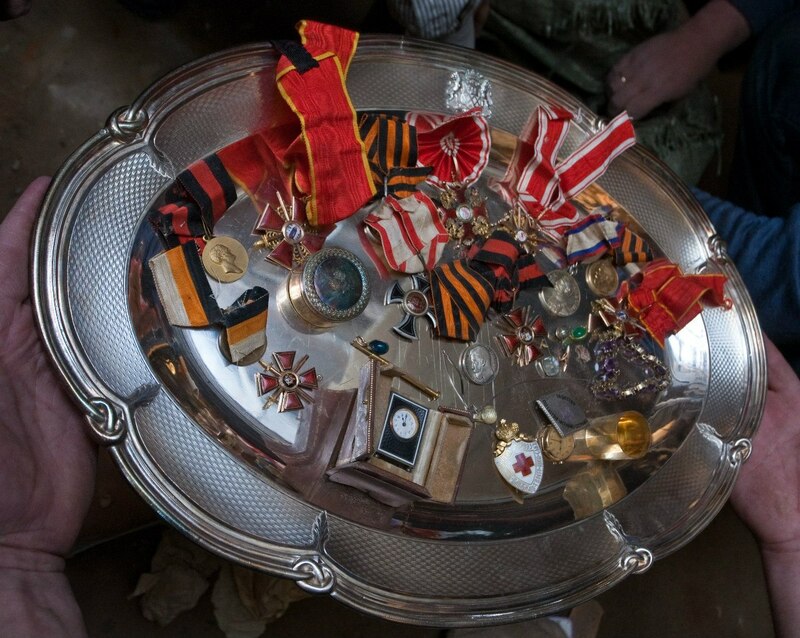 All of these objects actually belong not to the Naryshkins, but to all Russian people. I doubt any of the duke’s descendants would believe otherwise,” he said.